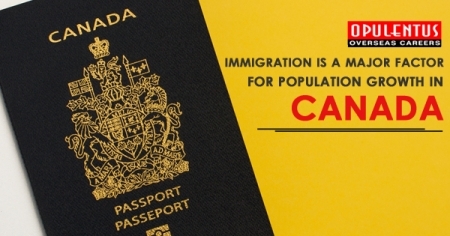 A current Statistics Canada report has shown that Canadian immigration established to be the primary operator of population growth in the nation in the year 2018. As per the report, current immigrants made up 61% of population growth in Canada in the year 2018. On Jan 1, 2019, the entire Canadian population reached 37,314,442 that comprised a total rise of 321,065 new immigrants in the year 2018. The population in Canada increased by over half a million in the year 2018. Global migration provided 80.5% of this development. It means out of the entire increase of 528,421 people in the year 2018, a result of 425,245 people were current immigrants & temporary residents. The number of individuals added to the population of Canada by immigration was much greater than the number of individuals added through normal growth or deaths minus births in 2018. The number of individuals added by normal growth was small 103,176. The Q4 of 2018 observed a record rise in the number of current immigrants. The report from Statistics Canada also reveals that the Q4 marked a population growth boost, which is surprising, as usually, population growth comes down during this time due to seasonal patterns. The Canadian Government initiatives proposed in current years to develop the immigration system have majorly added to the increase in global immigration to Canada. A significant improvement was the launch of Express Entry system in the year 2015. The Express Entry system announced a record-breaking 89,800 Invitations for Canada PR in 2018. Another significant feature of the Immigration System in Canada is the provincial nominee programs. The report of Statistics Canada says global migration was the primary driver behind the growth of population in 9 out of 10 provinces of Canada in the Q4 of 2018. Canada is proposing to improve the intake of immigrants in the approaching 03 years, as per the latest Immigration Levels Plan of the nation for the years 2019-2021. Canadian immigration intends to bring foreign talents to overcome labor market deficits in the nation. Stay Updated with our newsletters to get the latest updates and information on immigration and visas. We request you to fill up the free evaluation form presented by Opulentus to take the initial step for your Visa and Immigration Process. We have more than 18+ years of experience in Overseas career and Immigration Industry.